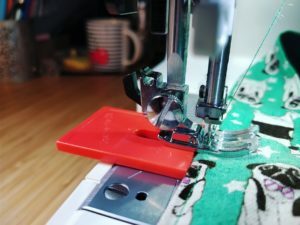 Part 2 of my guide to best sewing accessories review. 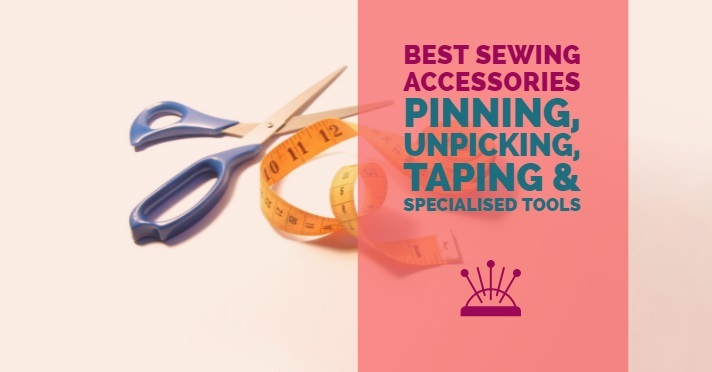 Today I cover best pins, tapes and other specialised sewing tools that will make your sewing a breeze. See out Part 1 of best sewing accessories HERE. 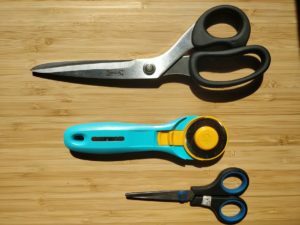 BEST SEWING ACCESSORIES aka the must haves! Handling your fabric while sewing can make or break the final result. Below you will find some tips to keep your fabric in great condition during construction. Having the right pins for the job will save you a lot of struggle when preparing and sewing your fabric. At first I didn’t think there is much difference in different types of pins, they all seamed small and sharp right? Wrong… I learned it the hard way, when I used my flower head pins on a very light net curtain fabric. I have created irreversible “holes” that were not going away no matter what I did. Similar thing happened with my delicate stretch cotton I was using to make a t-shirt. The fabric was quite light but had a print on top and my “fat” quilting pins didn’t want to go through with me forcing it. I’ve learnt my lesson and now always have at least two different types of pins: large flower head pins (also known as quilting pins), which I love and adore as they are so versatile and I use them in 90% on my projects, and small and slim bridal & lace pins for delicate fabrics. Flower head pins are longer than standard glass head pins and have a significant advantage of reaching more material so you need less of them and therefore misshaping your material a lot less. Also put them horizontally to your sewing line and because they have flat heads you can sew right through them without having to remove them, great option for those we do not tack/baste and need to keep layers in place while sewing. No matter what pins you use, you can’t do without a magnetic pin cushion. This £6 accessory is the best thing I have spent my money on ever. Especially when you have kids or pets and a bowl full of pins is at risk of being thrown all over the floor. This little thing not only holds them in place but also the magnet is strong enough so you can hover over any spilled pins and it will lift them from the floor just like magic! 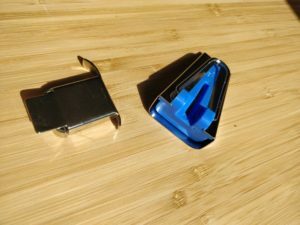 Another great sewing tool to keep things in place instead of pins is a hemming tape. This double-sided glued tape will keep your hems, necklines, armholes perfectly together so you can sew it in place. Great especially for small tubes like cuffs or trouser legs where there is not much room to take up the material and pin it and then machine with pins sticking right left and centre. This is only a temporary glue that is meant to hold two pieces of fabric together for you to sew it easily, and I would not recommend it to be a long term solution instead of a seam as it will wash off and fall apart in the wash.
To make my project assembly faster I like to mark my sewing seam allowance (usually 5/8 inch or 1.5 cm) with a paper washi tape. This paper tape is great for beginners as they learn that feeding the fabric at the right seam allowance is crucial to the seam being nice and even. For fast sewers who like to just get going it offers a visual reference without having to strain your eyes and look for a groove on the metal plate (where there are usually 8 different markings for seam allowance). If you have large hands, like me, and find the unpickers that come with your machines too fiddly ( I do! ), then buying a bigger one that will fit in your hand nicely is a very good investment. Unpicker/seam ripper is probably the most used sewing tool, so having one that doesn’t slip through your fingers and gives you control over what thread you cut is what is going to make your sewing much easier. None of the accessories covered below are by any means necessary to achieve great sewing projects. However, once you have sewn for a while, you have also struggled with some construction steps or certain fabrics more than with others. 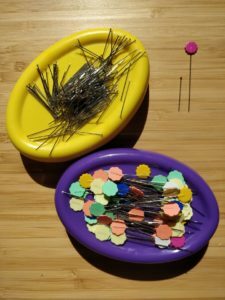 You were not the first nor the last person to do so, so with time we started seeing a lot more sewing accessories that were made for one specific sewing task and make it less fiddly or tedious. One of my favourite tools that does just that is a JEAN A MA JIG which is really a plastic rectangle with a slit in it, but however simple it might seem it does wonders to sew bulky seams and tough fabrics like denim, when your foot would usually be on the steep uphill and not feed the material correctly due to the bulk. This little baby levels the foot and makes the bulky seams easy to start with no problems what so ever. And what a cool name ! Another tool that was invented to do one thing only, but very well is the bias binding maker. Well it does need you to iron the folded tape it creates to maintain it’s shape, but it does essentially create a double folded biased tape from your chosen material. Biased tape is great for finishing necklines, armholes and hems, and if it’s made from the same material as a dress it’s simply the most perfect finish you can get. So in theory I would recommend buying one if you make a lot of tops or dresses that does require a bias binding edge. In practice I have had one for over a year until I finally made a project that needed a bias tape, and then…. I realised that I have bought the wrong size of the bias binding maker that makes very wide bias tape, far too wide for what I need, so I’m on the fence with this tool. Had I bought the right one, maybe I would be praising it now, but again, it took me a year to actually open the packet, so judge for yourself. 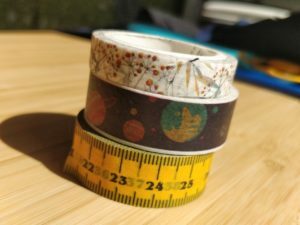 The next tool I acquired only recently is a magnetic seam gauge, which can be used instead of the paper washi tape I described in Part 1 of the Best Sewing Accessories. 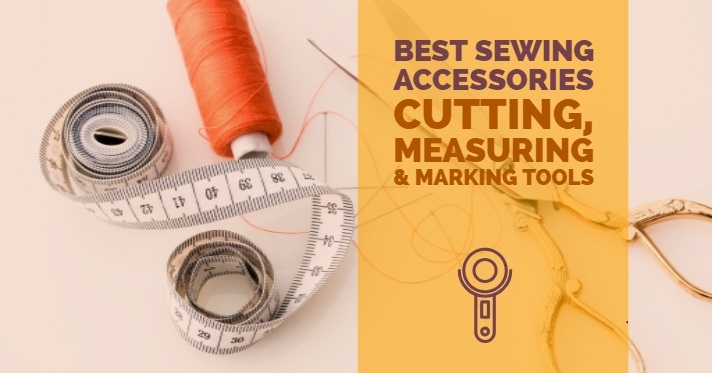 It has a powerful magnet at the bottom and “sticks” to the metal plate next to your sewing foot that has all vertical seam markings to help you sew with the correct seam allowance. Do I prefer this to a washi tape, no. Is it useful, yes it is, however, it gets in the way if the seam allowance you need to use is small like 3/8″ or smaller. It does work very well for the standard seam allowance of 5/8″ etc. It guides the fabric nicely at the marked seam allowance ensuring straight seams all the way. Also a recent addition to my accessories kit is this little beauty, an aluminium hem gauge for pressing. If you like your hems even and don’t like to spend a long time in measuring, marking, turning up, pressing, only to find that it is crooked, this is the one for you! It has a gentle curve, so you can use it on circle skirts etc. and has all traditional hem lengths marked. All you need to do is to fold the fabric and press with an iron, couldn’t be easier. It has cut the preparation of the hem by at least 70% for me, as it’s so so so easy and fast. Last but certainly not least, I would like to give you a quick intro to the most expensive sewing accessory that you can get (apart from the super duper machines), an adjustable dress form. 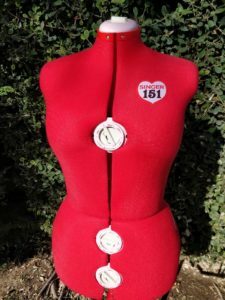 This almost life size mannequin, is fully adjustable so you can set it up to your bust, waist and hip measurements and fir your projects during construction. Note that they would come in at least two different sizes so if you are like me on the larger ed of the scale, make sure that you buy a larger size dress form so it actually extends to your size, as having one too small defeats its purpose. It is particularly useful if you tend to have issues with fitting into the standard size of the patterns, and always require making adjustments. If 4/5 of your last projects, you cut out the pattern in your size and it fitted great then you won’t need one for quite a while. I end up adjusting every single pattern I make, and my Singer 501 dress form is very useful as I don’t want to rely on my boyfriend’s pinning skills. I found it especially useful for marking the length of the dress or skirt to create an even hem. As most of use have a bum, the back of the garment will usually need to be tiny bit longer to compensate for our bum curve, and the dress form makes it super easy to take that into account and have a perfectly straight hem. If most of your fitting issues are in the bust area, then you will find a dress form very useful as it allows you to pin every last pucker and seam as is you were wearing the garment yourself. If you fancy getting any of the products described above, find the links below to both UK and Spanish amazon sites. As we don’t have many online choices in Spain, I tend to order from them and top up my sewing box on frequent visits to lovely UK haberdasheries. We only recommend products we have personally used, and by purchasing the products through the links below you support our sewing community, as the profits from the affiliate program are used to pay hosting fees for this website and our blog. Thank you for using the provided links. If there is a particular product you wish to purchase let us know and we will publish a dedicated link for it. With so many sewing accessories, tools and gadgets, which are worth spending your money on? 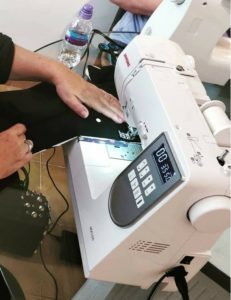 See my guide for best sewing accessories if you are a beginner and need to buy your first sewing kit, or if you are a confident sewer and want to know if there are products that will make your sewing life easier. When people ask me which is the part of sewing I enjoy the least I always say THE PREP. The preparation of the fabric, pattern, tracing, cutting and all that goes with it. This is where most of my project time goes into and this is why I have invested in few items that make this part slightly less daunting. I will go through the items I use in every project, as they have been tried and tested many times, they are categorised by their function. This is part 1 where I cover basic cutting measuring and marking tools. Part 2 with more sewing goodies coming soon. 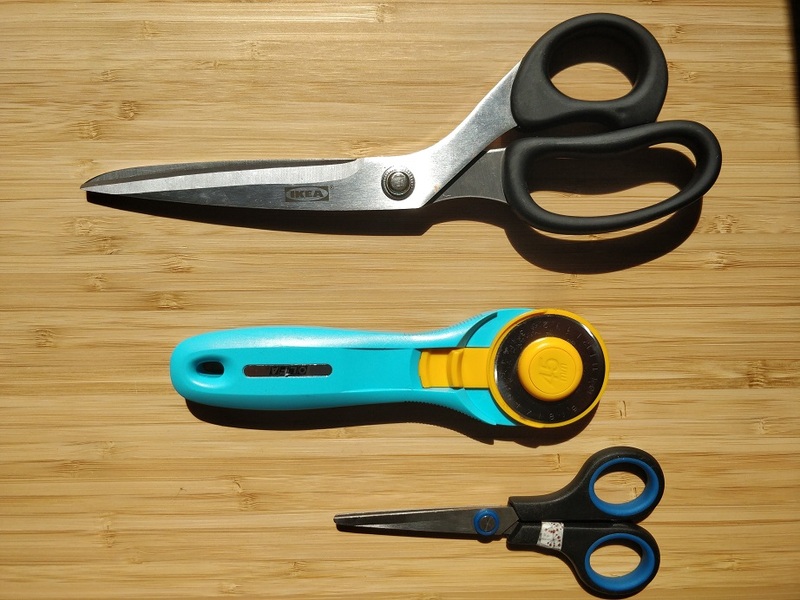 Remember lock up your fabric shears away so that nobody uses them for other jobs in the house, if you use them to only cut the fabric, they will last you a lifetime. Don’t spend a fortune on it, the good pair of shears should not be over £25. My pair is from the IKEA sewing kit which is about £20 for the entire set (including all other accessories). Don’t be tempted to overspend as you might end up like me, using your rotary cutter for 90% of the cutting . Since I discovered the rotary cutter, I hardly ever use anything else. 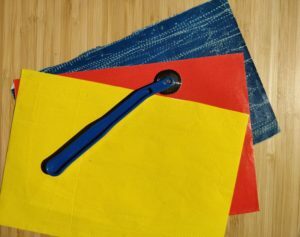 It is super sharp, with inexpensive blades and makes 100% perfect cutting lines no matter what fabric. 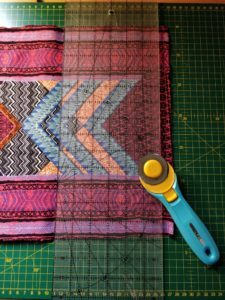 It’s essential for cutting stretch and slippery fabric as they do not get misshapen while cutting, or for quilting to cut those perfect squares or triangles. Most cutters have a 45 mm blade and you can use the blades from other makers to fit your cutter as long as they are 45 mm. Rotary cutter and quilting ruler in action. In order to use your rotary cutter you need to cut it on the self-healing cutting mat that will not ruin your table or floor. The size that I found best for over three years is 43 cm x 56 cm (17 inch x 23 inch). It is large enough to cut pattern pieces, make your own biased binding and be portable (I did sew a special travel bag for it to make it more handy). Since I’m now making more sewing projects day by day, I have decided to upgrade my cutting mat to a size bigger (60 cm x 90 cm) , but it will stay put on my desk as it will be too big for taking it to classes. 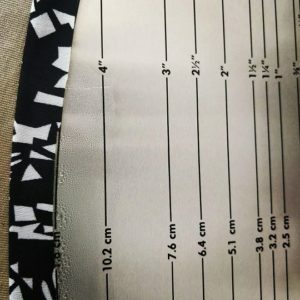 Most if not all cutting mats have one side in metric and the other in imperial measurements with additional handy lines across representing different angles, which you will use later in your sewing when making biased binding etc. Finally, in the cutting category we have an item that I only got a year after I got my mat, and oh I wish I got it sooner! A humble quilting ruler, also known as Omni Grid. It’s made of see through plastic with imperial markings going both horizontally and vertically. It has so many functions, I could write an entire page only about that, but in short, it helps you cut material on the cutting mat as it hold the material down while you cut it with rotary cutter. It also helps you positioning the pattern pieces against the grain line (especially important for jeans). 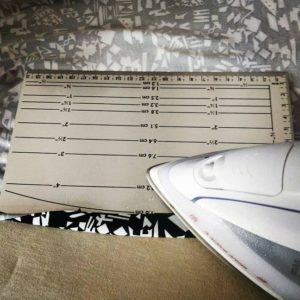 I have used it countless times to mark my hem (I would put the unhemmed dress on the dress form and use the quilting ruler to measure distance from the floor to my desired hem length and mark it around the dress to sew perfectly even hem). For avid quilters, it will help you to make sure your quilting pieces are identical and aligned. And 100+ more uses. This is the only ruler I use nowadays, this plus a tape measure is all you need. 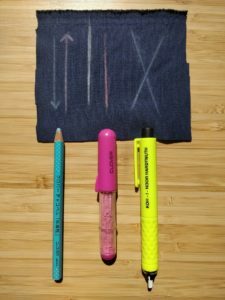 When it comes to tracing the markings from the pattern to your fabric, I only ever use a chalk pencil (blue on the picture) or scissors to snip the notches instead of marking them with pencil. I love Clover Chaco Liners (pink on the picture) to make straight lines and mark out things quickly. They have a tiny wheel on the end that distributes the chalk in a perfectly straight line, the downside is that the chalk is very fine and this results in the lines disappearing quite quickly. Mine are pink and white, to allow for all fabric colours and always have a contracting one. I know a lot of people use the fabric markers, which are water erasable or iron-off (markings disappear with heat), however I have only ever bought one, and by the time I ended up using it, it has dried off. I get all my marking using chalk pencil and chalk liner and if all fails, I turn to old trusted pencil. One item that I would recommend buying with time, as you sew more and more, would be a tracing wheel to use with carbon tracing paper. It works on the same principle as old typing machines used to: you buy sheets covered with colour carbon, place them between your material and your pattern (colour carbon facing the wrong side of the fabric) and you use a tracing wheel to go over the markings on the pattern sheet you want to trace to your material. It’s particularly great for tracing darts, pleats and other long lines you may need to mark into your fabric. Downside, it sometimes doesn’t wash off completely, so always use it on the wrong side of your fabric. Whatever you end up using, make sure you have at least two colours, one that will be visible on light fabrics (e.g. blue, pink) and one that will stand out on the dark fabrics (e.g. white, yellow). My guide to best sewing tools will continue in the next blog post where I will go over more basic tools like pins but also will include lesser used, but equally useful items like biased binding maker, magnetic seam guide, jean-a-magic and more!